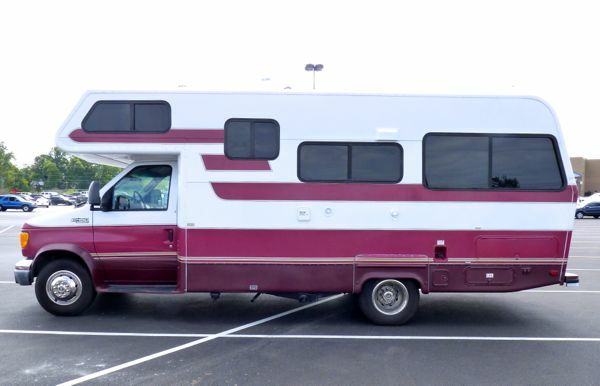 Inside, as the above diagram shows, the RV includes all living areas normally found in a small apartment. 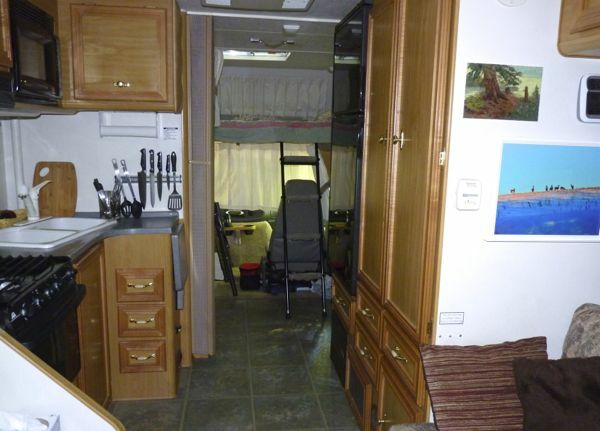 In the rear is the Lounge, in the middle is the Galley, toward the front is the Head, over the cab is the Loft, and of course, at the far front is the Cab. Below you will find links to each “room” with details and photos. 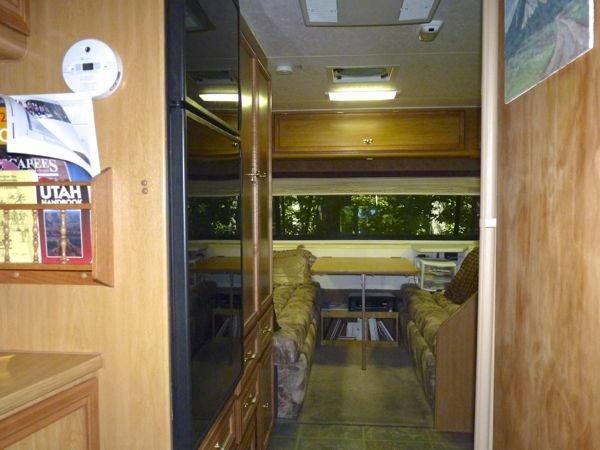 The living space is about 156 sq.ft. Ceiling height is 6 ft. 6 in., which is plenty for this short guy. There are 9 tinted thermal-double-pane windows (6 of which slide open) and have either blinds or curtains. They let in ample light that contributes to a spacious feel. Three roof vents aid with ventilation; one over the loft bed, one in the shower, and one over the lounge area. There is also an exhaust vent in the hood over the stove. Cabinets run around the lounge area on three sides at the ceiling, over and under the kitchen counter, under the wardrobe and refrigerator, next to the entry door, and one is concealed under the head of the bed in the loft. A fanfold door can be closed to separate the front from the rear portions. This would come in handy to provide privacy between the loft bed and the beds in the lounge. It has vinyl flooring in the kitchen, bath and entry area, and carpet in the lounge and cab. At the front is the truck that carries my home on wheels. It’s a 2004 Ford E-450 Superduty cut-away with a 6.8L 305 HP V-10 engine, mated to a 4R100 automatic 4-speed transmission with overdrive. It has no problems taking me anywhere I want to go. The dually chassis comes with ABS disc brakes all around, Bilstein gas shocks, and a steering stabilizer. It has dual Velvac driving mirrors, and running boards on both sides for easy entry into the cab. I’ve added reflector strips to both sides of the bumper and the mirrors for extra safety. Note that the two black rectangles, at the top front, are only simulations of windows. 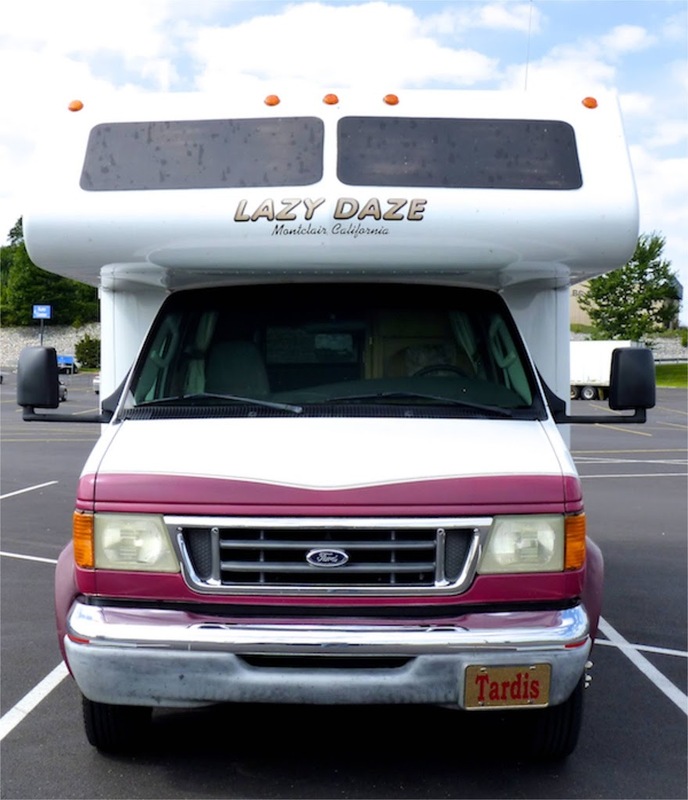 It is one way to identify an oncoming Lazy Daze when seen from afar on the highway. On the driver/road side can be found a storage bin under the couch; this one stores electric and plumbing gear, and an air compressor. Below it is the propane tank and connectors for cable-tv and a landline phone. Just to the left is the gas fill cap, and below it a tube to stow the 15 ft. sewage hose. In the middle are the shore power connection, fresh water fill and shore water connection. Above the kitchen window can be seen the exhaust for the stove hood. Toward the front, under the body, are the dump valves; one for gray and one for black water. Also there, is found the exhaust pipe for the generator; which conveniently puts it on the opposite side from the canopy. On the passenger/curb side is located another couch sized bin where I keep tools, leveling blocks, and various camping supplies. There is also a smaller bin, just behind the rear wheel, that holds my truck supplies like fluids, oil, cleaners, rags, etc. In the middle are the furnace exhaust and access to the water heater and rear of the refrigerator. By the entry door is the bin for the two deep cycle house batteries on a roll-out tray. And, below that is the 4k watt Onan Microquiet generator. There is a manual step and an assist handle for entering the rig, and an entry light above the door. The door has both a handle lock and a dead bolt lock. There’s also a catch to hold the door open, leaving the screen door to provide ventilation. At the top is a manual 12 ft canopy that can be deployed by one person. 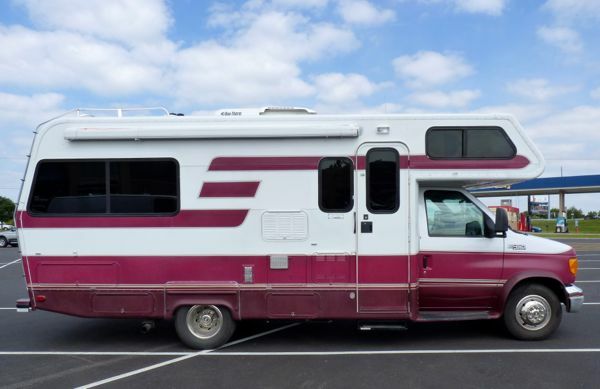 At the rear can be found a continental style cover for the spare tire, 5000 lb hitch for towing, and a ladder to the roof where there is a luggage rack. Marker lights are at the top front and rear, and running lights are on the corners. I’ve added reflector strips on both sides of the bumper for extra safety. 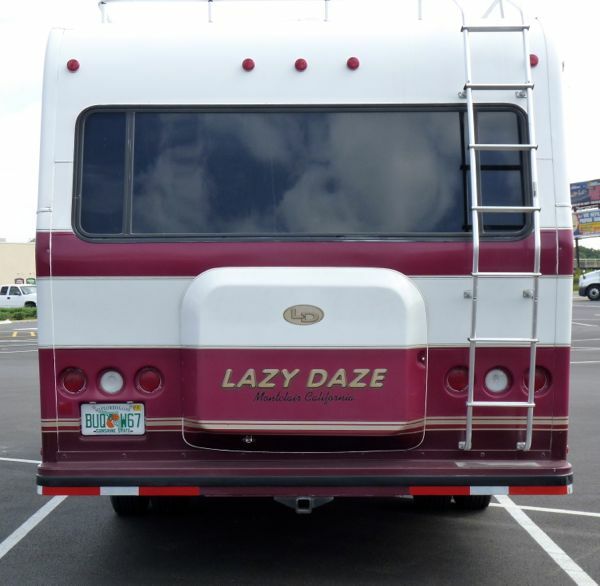 Since the Lazy Daze motorhome has all the essentials, it’s like living in an efficiency apartment on wheels with all the amenities. I am very comfortable wherever I go.